John Constantine. The Hellblazer. 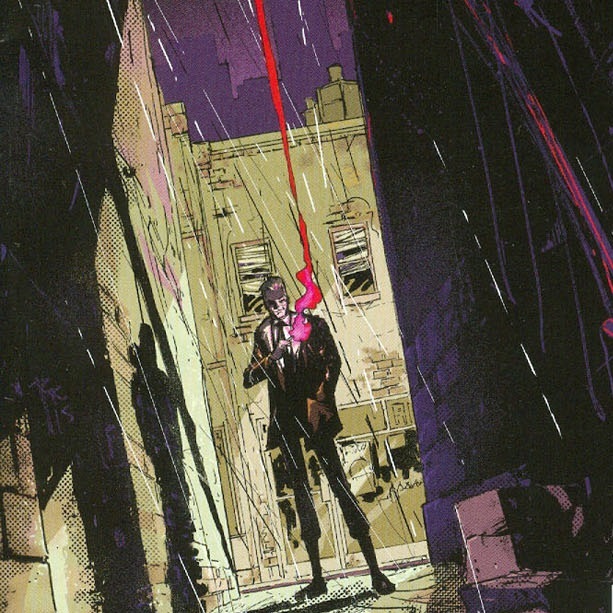 After a respectable run as the longest-living Vertigo ongoing ever, one that attracted some of the finest talent the UK had to offer, DC tried to bring him in as the cocky leading man of the mystic side of the DC Universe, having him headline Justice League Dark and eventually developing his own solo title. Those roles never really took off. Nor did his TV show, the unfortunately neutered NBC procedural Constantine. But the character himself remains one of DC's most fascinating, so it's no surprise that with the new DC You push, they're giving John another shot. In Constantine: The Hellblazer #1, John is living life the way he always has. Fresh out of a recent scrape and back on the prowl, he supports himself with petty theft, cons, and maybe a spot of seduction here and there, all while ignoring the warning signs amongst the local ghosts he knows that something big is coming. Instead, he puts it off to hook up with Blythe, a local demon running a legit(ish) business topside who needs just a little favor. The writers this time around are Ming Doyle and James Tynion IV. Tynion, a student of DC superstar Scott Snyder, has been kicking around DC for the last couple years or so, most prominently on their expansive weekly series Batman Eternal. Doyle has primarily worked as an artist on a variety of books like Quantum & Woody and Young Avengers, but has recently been expanding into writing gigs. Tynion's work tends to be... let's just say 'wordy' and be nice about it, and I'd hoped that sharing scripting duties with an artist like Doyle might temper this tendency. Sadly, it does not. The book maintains the now de rigeur running monologue throughout the issue, but it's mostly filled with fairly banal ramblings as he wonders what the cops think of the scenes he leaves behind or talking about how he doesn't really feel fear anymore. Which is fine, I guess, if it came into play in the story, but it never does. Unless it's there to be blunt as hell about what the book is about, as with the book's opening monologue. But at least there, the conversation has a purpose, a turn, a sliver of a dramatic hook; the monologue has an arc, one that roughly mirrors what's going through the head of its listener. I'll take blunt but apropos over everyday meanderings any day. Saying that Riley Rossmo is an immensely talented artist with a visual style few others approach is hardly necessary. Readers who followed him on Bedlam or Rasputin are already aware of this; anyone else just needs to grab any random page from Constantine: The Hellblazer #1 and study it. His characters have immense physical presence, their posture and the way they walk telling you everything you need to know about a person. His design work is similarly impeccable - a brief tour through a campy take on Dante's Nine Circles of Hell is fantastic, simultaneously funny and off-putting. And he's supported wonderfully here by Ivan Plascensia. 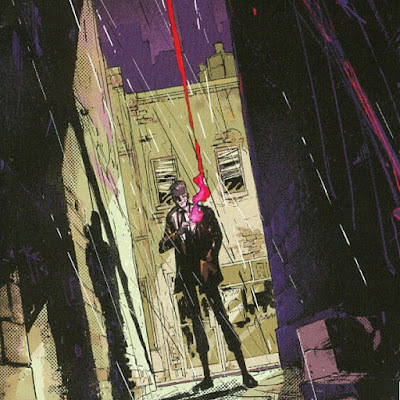 Most horror-influenced comics tend to go for a fairly muted color palette, to introduce a sense of claustrophobia to the works. Plascensia's is vivid and lively, save where the ghostly dead are concerned. Indeed, his portrait of hell, or at least the denizens thereof, takes it up another notch, a vivid, supernatural hue dominates, full of bright, regal colors comes to dominate. The demonic are unearthly, and that calls for bursts of unpredictable, unnaturally bright color to help get across. The story doesn't really support the otherworldly feel of the creatures, most of whom are business owners, former lovers, or old friends, but Plascensia makes it feel right. Seriously, you guys, Riley Rossmo and Ivan Plascensia make a great team. And they work really well with letterer Tom Napolitano. There's a lot of variation of lettering style, here, many of which could easily go wrong. Ghosts speak with a lightly faded speech bubble, but not so dim that they aren't immediately visible. Each demon gets its own unique speech bubble and font, which could grate, but they end up being a distinct visual representation of each character, a way to further their look beyond the boundaries of their body and differentiate them from the mortal cast. It's good work, showier than letterers typically get, but very much of a piece with the world we're presented. But - and no offense to Napolitano, who did good work - everyone speaks too much. 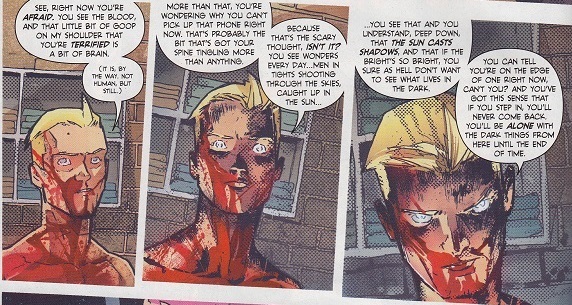 Even if Rossmo worked in DC's house style, which he very definitively does not, the script here spends too much time elaborating on every little thing that goes through its characters heads, particularly Constantine himself. The plot is slight, but it works. The art is gorgeous. 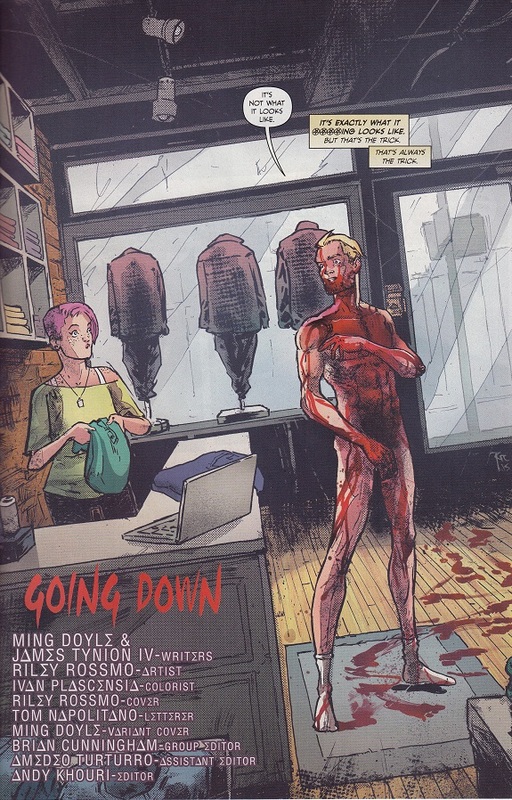 But Doyle and Tynion don't seem to have much to say about John Constantine that we haven't heard already, which makes spending so much time hearing it again a bit of a tough sell. They bring back the smoking and the bisexuality and many of the other traits he shed in his transition to mainstream leading man, but they don't do much of note with them. As a statement of purpose, it's satisfying to see; as a story, less so. Look, ultimately, I'm going to be back for another issue of Constantine: The Hellblazer. For all the issues I have with the book, this creative team has at least turned in a Constantine tale that feels fresh, interesting, and weird. I like their take on John, an energetic guy who lives his life moment by moment because he knows how likely it is that everything will come screeching to a halt. What's more, Rossmo, Plascensia, and Napolitano have created a beautifully-realized world here, one I'm eager to revisit. But right now, Doyle and Tynion are working at cross purposes with their artists, and that definitely hurts the book. If the two writers can step back and trust their creative partners to physically express what the many, many text boxes touch on, this will grow into a huge winner. As is, it's an interesting curiosity that needs a little fine-tuning. 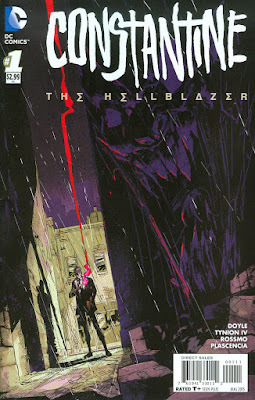 Constantine: The Hellblazer #1 was written by Ming Doyle and James Tynion IV, illustrated by Riley Rossmo, colored by Ivan Plascensia, and lettered by Tom Napolitano. 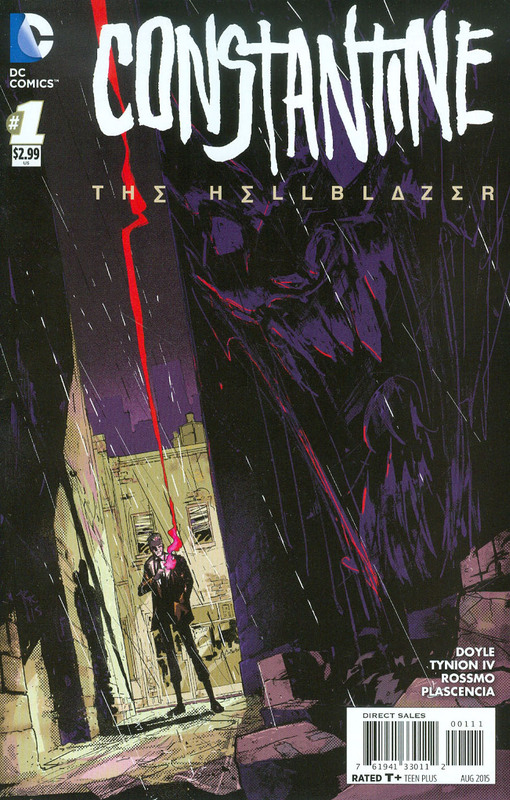 Published by DC Comics, Constantine: The Hellblazer #1 was released on June 6th, 2015.